I was sitting here going through my blogger dashboard and checking in on the blogs I read everyday. 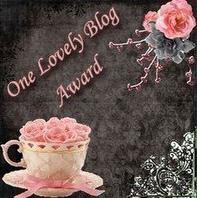 Lynn over at Rattie Corner was awarded the 'One Lovely Blog' award. Congratulations! I always enjoy reading about her ratties. I also saw she awarded my blog too, wow! It must be my lucky day, first I find $4 on the ground & now I get an award! Heehee. Thank you so much Lynn, I really appreciate it! If you read my blog, you know it is pretty much a mix of everything. It is about my long distance relationship with my fiance F.B., it is about my travels to the Philippines, it is about what books I'm reading, what music I'm listening too, what stores I'm shopping at, etc. And you also know a big part of it is about my pets, rats included! Basically this blog is about my life and I love writing about different topics that are important to me and that may be interesting or helpful to all of you! I also had my very first blog giveaway this past month and I know I'm planning some more for the future! Thank you for reading! I have too many favorite blogs it's not easy for me to narrow it down, haha! Congrats everyone!